Abandoned Kittens Taken Care Of By Mama Tom Cat! A cat was found protecting a litter of kittens, and taking care of the little hair balls. When the rescuers examined the cat, they got astonishingly surprised to find out that cat was... TOM! 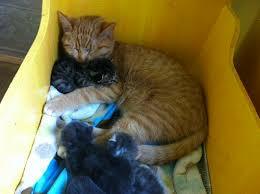 Left alone on their own on, the side of the road, the kittens cramped together to feel warm. Soon, the Homeless Animal Adoption League in Bloomfield, New Jersey, received an anonymous phone call informing about the abandoned kittens. In fact, the little ones were not literally alone, they had company in an adult cat which seemed to have adopted the role of the care taker and performed it well actually, to the extent that both the anonymous caller and the rescuers thought it was their mother! The caller even chose to stay away of the litter where kitten were put to avoid any act that may drive the mother to a state of rage. When rescuers showed up, the ‘Mama’ cat was far from any aggressive act or gesture, that it even looked as if she was relieved to see the right people to take care of her kittens. So the kitten were taken back to the shelter. Back at the shelter, the kittens were fed and examined, and the workers were happy to find out that each was well and healthy. After that, they turned to examine the Mom cat, and right then, they had their mouths open in surprise! 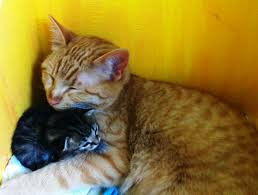 What they thought to be the kitten’s mother was a Tom! They couldn’t understand where all this love and tender towards those kittens came from, as such a behavior is not often seen in male cats. They assumed him to be their father or an older brother. Anyway, the cat well played the mother’s role; he played with the kittens, groomed them, and did what a mother would have done.